I think we should get a bamboo forest in minecraft bamboo will be there and no trees when you cut down bamboo you get bamboo sticks which can be used in these recipes first up the bamboo flute write click a note block with it to make the sounds change. 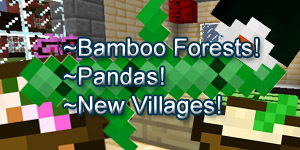 Mob:there,s a panda attacks you when you hit it. panda skin:Put nine around a Egolden apple to get panda power which gives you a new potion affect called spider and you can climb walls and strength for 3 minutes. Mining when mining you can find a ore called pandimite which you can use to repair any item and it fixes it more. This thread has already been made by another guy.. I wrote mine before him you should be telling him that he just took my idea check the time. No, this thread was made AFTER that thread. That thread was made on March 12th 2015. Considering how both threads have different features, this thread might not be locked. You joined yesterday. If you see my thread it says "Last edited 4 days ago". *Ahem*.. Please don't lie. I have proof and also lies don't last long.